Traveler's Lost Gold is a beautiful ranch-bred stallion with excellent lines. Sired by the perlino stallion Traveler's Moon Frost, who descends from a long line of dilute TWHs. On his sire line, Traveler's Lost Gold has the World Grand Champion Ebony Masterpiece, a grandson of the incomparable Midnight Sun. Further bloodlines on sire's side include Sun's Merry Man, Allen's Black Magic and Colonel Allen. Lost Gold is out of the palomino mare Butterscotch Sundae, a daughter of The Last Gold Chance, who is a prominent ancestor of dilute Walkers nowadays. Butterscotch Sundae is out of Miss Chatterbox, a daughter of the World Grand Champion Go Boy's Chatterbox. Go Boy's Chatterbox is a son of the WGC and great sire Merry Go Boy. Miss Chatterbox's lines also include Go Boy's Rocket R and Curlee's Spotted Allen. Traveler's Lost Gold is the ideal stallion to breed dilute foals with. He will pass on one copy of the cream gene 100% of the time! Available for breeding 2004 - present to all Tennessee Walking Horse mares. Other breeds considered upon request. Introducing Pushin' My Luck, a striking blue roan overo/sabino TWH stallion sired by Moonlight Chief. From his sire, Pushin' My Luck inherited the frame overo gene. Moonlight Chief is by High Moonlight, a grandson of the WGC Triple Threat. Moonlight Chief's dam, Design's Red Rose, is a granddaughter of the super sires Pride Of Midnight HF and Sun's Gunsmoke. Pushin' My Luck is out of our own mare Don't Push It, a daughter of the WGC and multi Horse Of The Year, Masquerading. He is by Eb's Black Charger, a Reserve WGC and son of the great Ebony Masterpiece. Masquerading's dam is a daughter of the WGC and popular sire The Pusher CG, through whom the sabino gene was passed on. Don't Push It's dam is another mare of ours, Coin's Blue Star, a daughter of the three times World Grand Champion and sire of World Champions, Pride's Gold Coin. Coin's Blue Star was out of Quarterback's Bebe, a blue roan daughter of Sun's Quarterback (who also sired WGC Triple Threat). She also carries a line to Branley's Roan Allen Jr, a known carrier of the sabino gene. Further lines include Merry Maker, Sun's Eldorado and Wonder Liz. Pushin' My Luck will throw flasy, naturally gaited foals that will definitely leave an impression. He is currently one of the only roan/sabino/frame TWH stallions standing at stud, so don't miss out him! Available for breeding 2007 - present, to all Tennessee Walker Horse mares. Other breeds considered upon request. Genuine Black Magic has been bred to be a champion, with impeccable bloodlines on both sides of the pedigree. Black Magic's sire, OSS The Tick, is a son of the World Grand Champion (WGC) Lined With Cash, who has made a name for himself as a sire of champions. Lined With Cash himself is out of two legendary horses, the WGC Coin's Hard Cash, and the ten times World Champion mare Gen's Silver Lining. This beautiful cross is backed up by Pride's Generator, the sire of OSS The Tick's dam Unscrupulous. Pride's Generator is arguably one of the most influential sires in the Tennessee Walker breed in the last few decades. OSS The Tick is a tall and muscular horse, both traits inherited by Genuine Black Magic. Genuine Black Magic is out of OSS Genuine Chrome, a beautifully refined mare with exceptional colour. She is by OSS Chromed Out Cat, a son of the great sire Kodachrome, who produced numerous WGCs in all divisions. He carries lines to The Pusher, Pride's Generator and WGC Ebony Masterpiece. OSS Chromed Out Cat's dam, Dillon's Miss Kitty, has a line to the great mare Wonder Liz, who produced many champion foals. 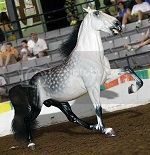 OSS Genuine Chrome's dam, Your Cheatin' Heart, was in the 2009 NAN Top Ten of Gaited Breeds. She is by Gen's Sir Charles, who combines the lines of Pride's Generator, The Pusher and Ebony Masterpiece. Her dam, Lily Of Silver, carries double lines to Midnight Mack K, a multi champion and super sire back in his days. Genuine Black Magic is the stallion to go with if you are looking for a big, strong but elegant foal. And if the saying "the family is stronger than the individual" is true, then you can be certain that there are not many breeding stallions out there with more class than Genuine Black Magic. Available for breeding 2010 - onwards, to all Tennessee Walker Horse mares. Other breeds considered upon request.